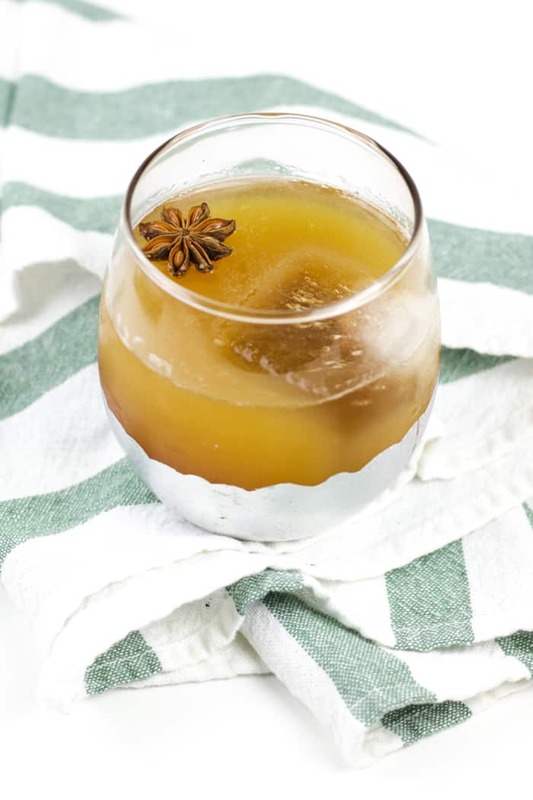 Spiced Apple Cider Rum Punch is the dreamiest fall cocktail to serve at your Thanksgiving table! Homemade spiced rum really takes the cake here. We’ll be spending Thanksgiving with Chris’s family this year, which means we’re sticking close to home. That will be a nice change of pace! Last year we trekked to Richmond for a food festival and then spent the holiday with my brother and his now-fiancée (!) in D.C., which was amazing. However, I’m really looking forward to laying low this year. I’m not really planning much of a menu this year. I’m definitely bringing dessert to our shindig, but other than that I’m probably only making Cranberry Apple Casserole and maybe a cocktail to share! 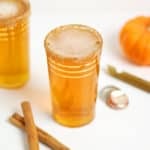 I usually make this Apple Pie Chai Cocktail at Thanksgiving, but this year I’m switching it up and introducing this Spiced Apple Cider Rum Punch. 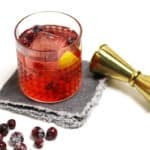 This is a cocktail we’ve been enjoying at home ever since the weather cooled down. 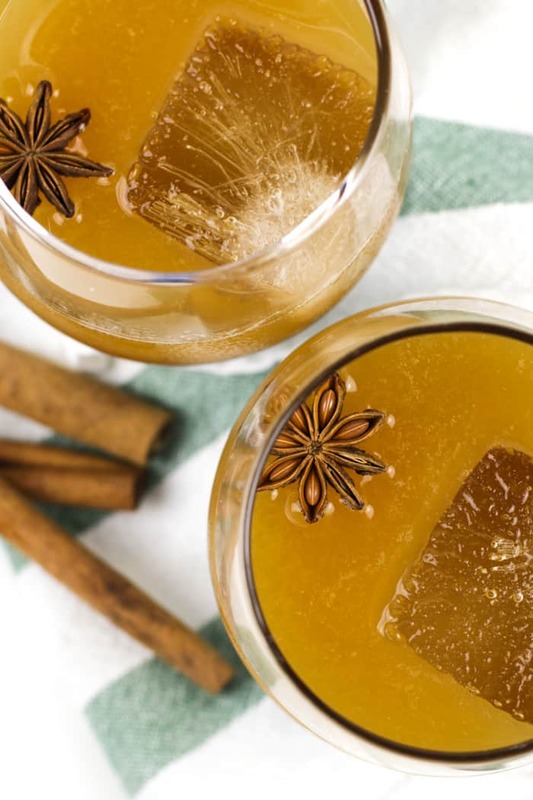 It’s just two ingredients — spiced rum and apple cider. But not just any spiced rum, y’all. Homemade spiced rum. It’s seriously the best. Ever since this summer Chris and I have been enjoying making our own spiced rum. I buy a lot of spices in bulk, so I usually have a few cinnamon sticks and such on hand to drop into a handle of rum. 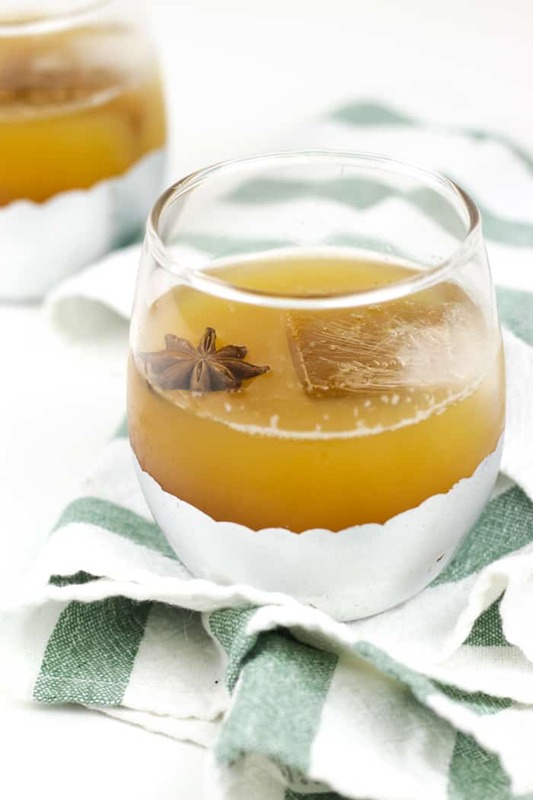 Infusions are so fun in the fall season, because you can experiment with whole spices, but you can make this rum any time of year. In fact, I used it in my Pineapple Mango Tiki Punch earlier this summer. 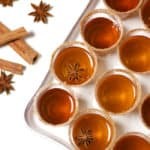 For mine, I usually use cinnamon sticks, star anise, black peppercorns, minced ginger root and a bit of vanilla extract. That’s it! Let it rest in a dark place for at least a couple days, and you’ll have a lovely, infused homemade spiced rum. The longer it sits, the stronger it gets. And yes, you can totally sip it straight if you like! 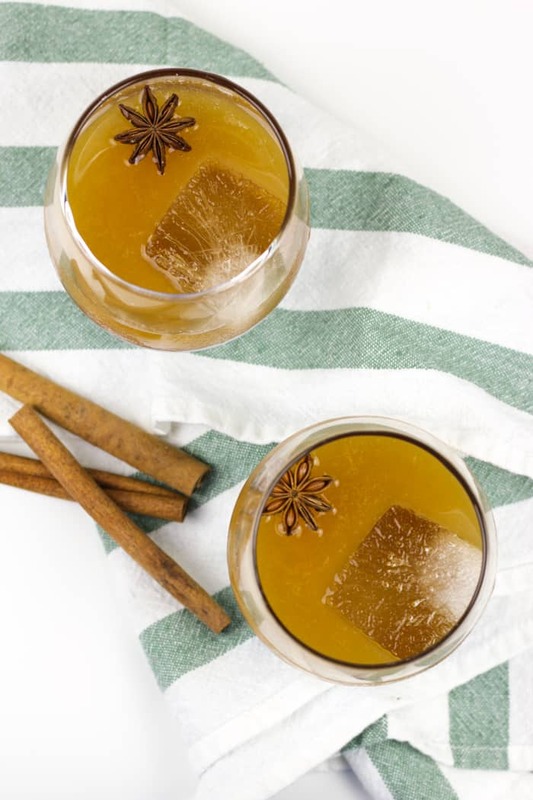 You don’t have to use homemade spiced rum in this Spiced Apple Cider Rum Punch. Storebought is totally fine! You can serve it warm or on the rocks, too. Lots of options. I do encourage you to get REAL apple cider, though. Not the clear, borderline apple juice kind. But the kind that’s darker in color and visibly has apple pulp settling at the bottom. It makes all the difference! If you need any Turkey Day recipes, don’t forget to check out the Blogsgiving archive! Meghan and I decided to take a year off, but there’s a whole treasure trove of recipes there to discover this holiday season. 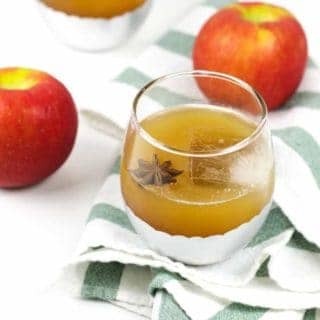 Spiced Apple Cider Rum Punch is the dreamiest fall cocktail to serve at your Thanksgiving table! Homemade spiced rum really takes the cake! 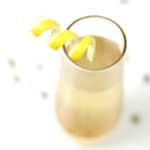 Fill a 16-ounce mason jar with ginger root, star anise, peppercorns, cloves, cinnamon stick and vanilla extract. Fill jar with rum. Cover and let infuse for at least 24 hours. Strain rum through a fine meshed strainer into a bowl. Decant back into jar and replace lid. Spiced rum will keep indefinitely. 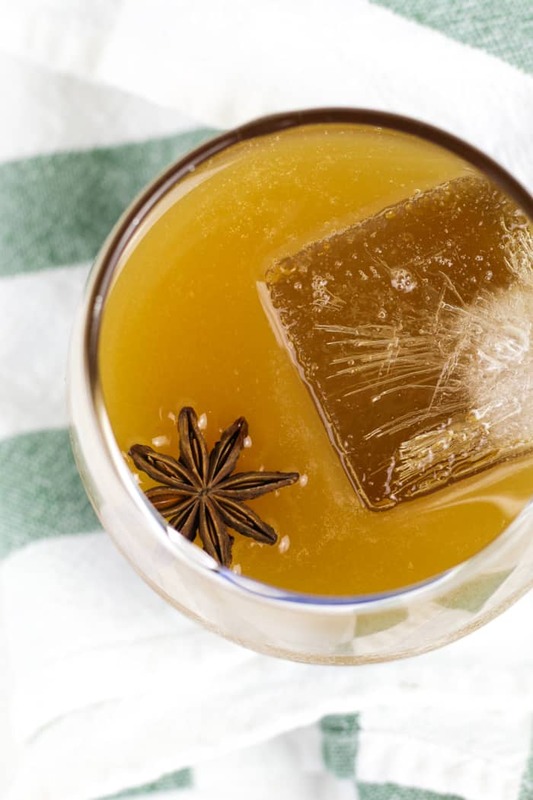 In a half-gallon pitcher, combine spiced rum and apple cider. Stir. Serve on the rocks. 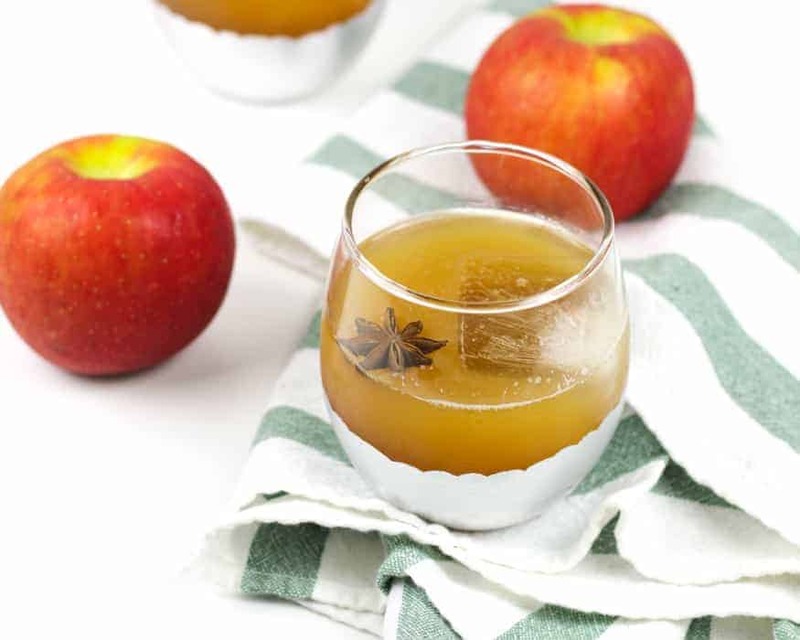 If desired, you can serve this punch with warm apple cider.